www.audifans.net :: View topic - Spot the ABS relay! Just had a quick look and I will need to buy a torx screwdriver to get the black plastic cover off. Am I right that if the fuse on this relay is blown then I will need to get a new relay? any idea of the cost where best to get one? 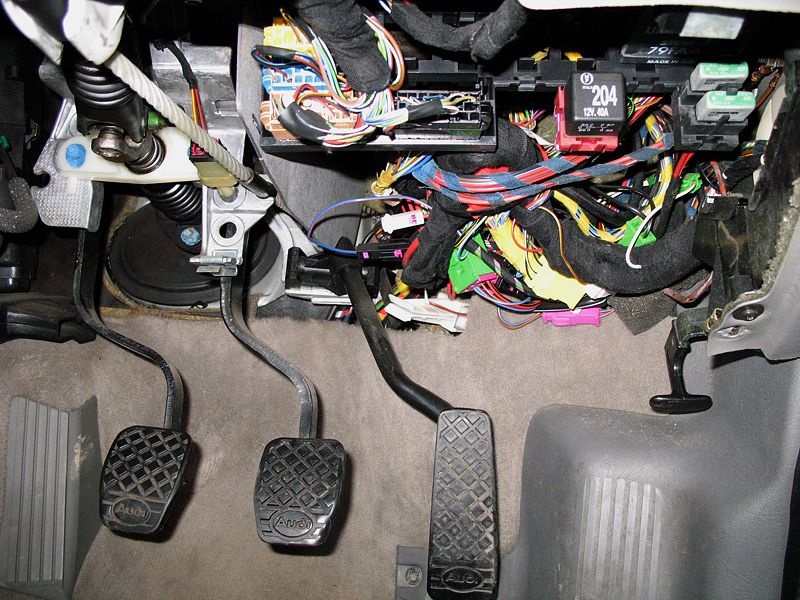 A 1994 car does not have the same system - there is no relay with the fuse on top. Could be an open circuit on a wheel sensor. Proud sponsor of the snack food industry. Very much doubt it is a wheel sensor. Wheel sensors only start to work when the vehicle moves. In this case the ABS light is on before the car has moved. The modulator does a self test when first started. There are 2 relays inside the modulator which will trigger the light if they fail. Location: Warwickshire - and Dublin! Gents, I'm suffering a similar issue: the ABS warning lights comes on at ignition - and stays on. I've had an auto electrician look at it but says he can't get the abs to 'talk' to his diagnostic laptop unit. My car is a 1994 Tdi Avant. I read elsewhere that 1994 was a 'watershed' year: pre 1994, the ABS couldn't be interrogated, 1994-on, it could. I've taken the cover off the modulator and noted the two relays within, so I guess those are the items Mikes2 refers to here(?) Elsewhere, I read about one behind the dash, incorporating a 10amp fuse: I'll look at that forthwith - mindful of Mike2's advice that these don't feature on 1994 models, yet conscious mine may be a 'crossover' car (not the first time this has happened to me!). So: any advice you might have would be gratefully received. Also, suggestions for reliable sources for parts: the garage is talking about four new sensors, replacing the ECU and / or ABS control unit. All of which sounds pricey...! ecu is under the rear seat - what's the number from that ? There is a fuse in the main fusebox for abs and a few other circuits. Does the abs pump run it's self test ? Oh! ok. So my car wasn't manufactured during any nebulous 'crossover' period then. Good to know. ECU is under the rear seat - what's the number from that? Under the rear seat? Oh. I read somewhere that with an Avant, it's located near the wheel arch. I've certainly seen something which resembles an ECU there. I don't currently have the car to hand, but once it's back, I'll have a good poke around again - and confirm the part number. Jesus, I'd hope the electrician had thought to check the fuses - please God, tell me he did! At some point down the years, the sticker peeled off the fusebox cover so I had to refer to online pics - but then failed to see the listing for fuse 31: ABS. I'll check that asap. I've also heard tell of an ABS relay with integral fuse located under the rear passenger seat...? Does the abs pump run it's self test?